You know, I put him on my vision board last summer - and then he came to New Orleans this spring and I got to go see him! That makes me two for two with vision board celebs - Madonna and His Holiness. 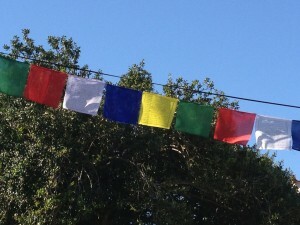 In honor of the visit from the Dalai Lama, the city draped itself in Tibetan prayer flags. They are hanging, large and small, in long rows and tucked in tiny corners everywhere - over shops, homes, along power lines. They are beautiful and hopeful and I love that people are keeping them up well after his visit. We have them hung over our porch and I'm in no hurry to take them down. I think in Tibet they stay up until they disintegrate. The way to control violence is to control hatred and increase forgiveness and tolerance. Our individual futures depend on community. We must think as a community-- as a global community. A calm mind is very important. When you have affection and compassion, you're happy, regardless of social standing. Our problems do not stem from lack of education or lack of money, but from lack of inner peace. Solving the world's problems requires intelligence, willpower and inner peace. These are simple yet serious ideas. Interestingly, the Dalai Lama is not a formal, serious man. He is so down to earth, laughing easily, telling funny stories, encouraging everyone to be happy and be themselves - he is a lovely man. He came to New Orleans with a group of monks. There was a big conference and the monks created a very elaborate and very temporary sand mandala. I never got a great look at the mandala-- my timing was bad-- but I did make it to the ceremony at the Mississippi River where the monks poured some of the sand into the river. They also handed out tiny bags of the sand - for "healing and enlightenment". I haven't done anything with the sand yet. I haven't done anything with a lot of things. My head swims daily with the long list of undone tasks (like blogging (! ), sending newsletters, updating calendars, keeping up with social media, addressing details around a brand new website, announcing cool offerings that I'm cooking up...) Seems I'm short at times on willpower and that's cutting into my inner peace. However, in the past weeks, I have prioritized time to grieve. I've kept all my appointments and attended/hosted all the events that were already scheduled. I went off for a delicious week of hiking in the woods on the Appalachian Trail (more about that later.) I am meditating every day, 15 minutes in the morning and 15 minutes at night. I have a daily writing practice. Plenty of other stuff happens too - just like it probably does in your life. Some day I'll get straight between what I actually do and what I perceive is possible to do in a day. And then I'll have that elusive inner peace. I'm learning to let myself feel it anyway, even when I haven't accomplished everything I've imagined I would. The city is so green and there are flowers blooming everywhere. I stop to admire them on walks to the bank and the library. I breathe. The world is too beautiful not to be grateful, completed calendar or not. And I have a feeling the Dalai Lama isn't worried about my to do list. He's probably much more interested in the development of my compassion, starting with compassion toward myself. I teach this to my clients and I re-learn it nearly daily. How about you? Is there room for you to offer some more compassion for yourself, some forgiveness, some time to calm your mind? 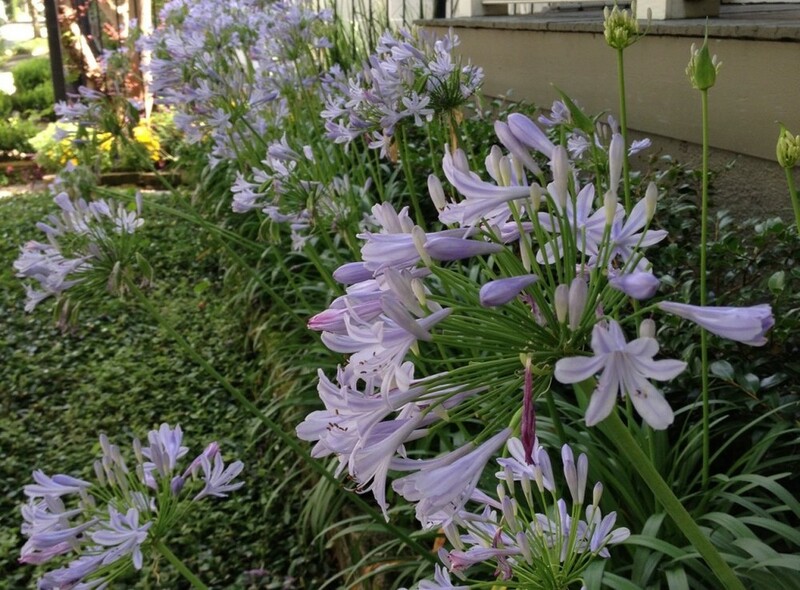 To take a couple of breaths, go outside, admire the flowers - marvel at being alive? Whether or not you've accomplished whatever's on that to-do list? Maybe I could make a zillion dollars creating little pads of to-do lists with the first ones at the top of each page actually saying things like, "Embrace gratitude." "Smell the flowers." "Smile." "Marvel at being alive." With express directions to do and check them off first. (Now I can add "design, make and market pads" to my to do list, ha!) I do make myself smile! Are you smiling too? Then we can both check that off! 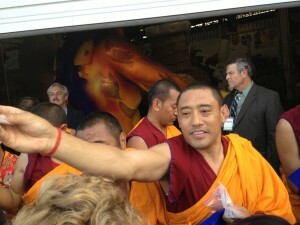 I bet wherever the Dalai Lama is today, he is also smiling and encouraging others to smile. And perhaps we are all one step closer to inner peace. Sign up for email updates and get my free guided 20 minute nature meditation. Use it any time you need a dose of stillness and connection. © Copyright Living Wild and Precious. All rights reserved.